Air-entraining additive based on lignosulphonates. Occluded air increases the durability and resistance to sudden changes in temperature that occur under ice-de-icing conditions. Dosage: 0.25-0.6% over cement weight. 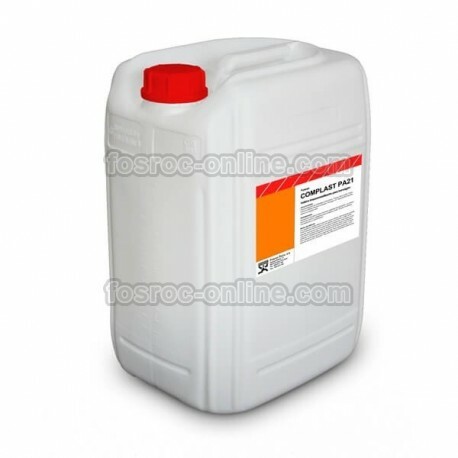 Conplast PA21 is an aerating additive based on selected lignosulfonates and aerating agents. It is supplied as a brown liquid that is instantly dispersed in water. The active agents in Conplast PA21 act at the interface between the kneading water and the cement / aggregate particles producing microscopic air bubbles, which distribute uniformly throughout the mass. Occluded air increases durability, providing protection against sudden changes in temperature that occur under ice-de-icing conditions. To produce concrete with occluded air that increases the durability and resistance to the damage caused by the ice and the deicing salts. Suitable for concrete roads, bridges, airstrips and other areas of concrete exposed to deterioration by ice. In order to improve the cohesion and workability of the concrete in which fine granulometries are to be used in fines and can cause exudation or segregation. To reduce the permeability of concrete with sandy or poor aggregate granulometry. To improve the stability, cohesion and appearance of joists and concrete slabs in the prefabricated industry. Air occlusion increases the strength of the concrete to the ice attack, reducing defects of the concrete. Occluded air bubbles help the formation of a stable cohesive mixture, which reduces segregation and exudation. Air occlusion improves workability and helps to produce a dense, uniform, textured mass free of gravel concentrations and segregations, increasing its durability. A reduction of water allows to produce a concrete of low permeability and greater resistance, when compared with that obtained with the single occlusion of air. Conplast PA21 complies with UNE-EN 934-2: 2010 Table 5 as air insulation. Optimum dosing of Conplast PA21 to achieve specific requirements should be determined by testing, using the materials and conditions under which it will be tested in practice. This allows the optimization of the additive dose and the mixture, as well as a complete evaluation of the concrete. As a starting point for such tests, a dosage of between 0.25 and 0.60 liters / 100 kg of binder, either alone or with cement such as ash, slag or microsilice, is usually used. Dosages outside the above range may be employed under appropriate supervision. By means of test samples, the compliance with the regulations with their specifications will be checked. Once the appropriate dose has been selected, care should be taken to ensure the consistency of the materials used and the mixing and distribution processes. The variability in the cleaning and degree of the aggregates can have different effects on the plasticizer and aerating properties of the additive. The air content should be analyzed regularly. There are several factors that can affect the air occlusion obtained for a particular dose of aerating additive, such as the type of sand used, the fineness of the cement, the presence of coal or organic impurities, the temperature of the concrete, the type Kneading, transit time or compaction. Conplast PA21 is only compatible with the superplasticizers of the Fosroc Euco range if you want to keep the a / c ratio as low as possible. If more than one additive is used, these must be added to the concrete separately and not mixed together before being added. The resulting properties of the concrete containing more than one additive should be checked by prior testing. Conplast PA21 is suitable for use with all cements complying with standard RC-08. The correct amount of Conplast PA21 should be measured by a suitable doser. The additive is added to the concrete with the kneading water to obtain the best results. Contact the Technical Department of Fosroc Euco to be advised and request an appropriate equipment and its installation. An overdose of twice the normal amount of Conplast PA21 causes a significant increase in the occluded air, which reduces the resistance in addition to increasing the setting time.